Congratulations for Becoming Grandparents: Welcoming a newborn in the family is not just a celebration for mums and dads, but for proud grandmas and grandpas too. For the first time in their lives, they will get to shower love on a kid without being responsible for the tantrums of a spoilt toddler. If you know someone in your family or friend circle who’s just become a grandparent, congratulate them by sending a sweet quote to usher them into life’s new phase. From cute greeting cards to funny messages on Facebook and Pinterest – there are heaps of ways to send your best wishes to the beaming oldies. 1) A parent’s job is to critique, judge and motivate. 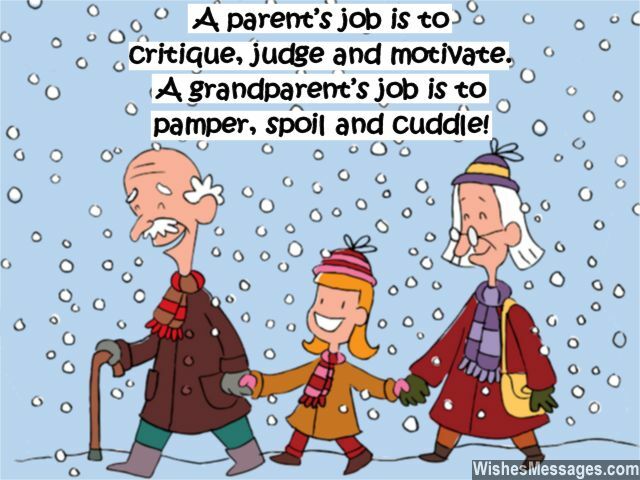 A grandparent’s job is to pamper, spoil and cuddle. 2) Your own children were your investments and your grandchildren are the sweet bundles of interest you have received upon maturity. Congratulations. 3) Congratulations for being promoted from the post of Mother to GrandMother. But don’t start celebrating yet because you will soon be demoted to the post of BabySitter. Congratulations. 4) The peace and silence of your retirement is about to be broken by the sweet squeals and screams of your grandkids. Congratulations. 5) Congratulations for welcoming a worthy candidate for passing on your life’s wisdom. 6) It’s time to wake up from your retirement slumber, you have a new job now for which you will be paid in kind – cute hugs, smiles, laughter and some of the best memories of your lifetime. Congratulations grandma and grandpa. 7) On becoming grandparents… just think of yourselves as parents who have a lot of love to give and no responsibility to take. 8) Your grandchild will finally make your own children realize how amazing you have been as parents to them. Congratulations. 9) Your kids were the seeds of life that you sowed. Your grandkids are the fruit your family tree has borne. Congratulations. 10) Congratulations for finally finding an ally in your battle against your children. 11) Parents are like trees which provide shade to their children. But grandparents are the roots that hold the tree together. Congratulations to the new grandpa and grandma. 12) The beauty of having grandkids running around the house is that they make you feel younger even as you grow older. Congratulations. 13) Enjoy your new found responsibility of being officially allowed to spoil your grandkids. Congratulations. 14) And you thought that the best in your life is over? Congratulations granddad. 15) As grandparents you will be able to experience all those beautiful things about bringing up a child that you could not appreciate when you were parents. Congratulations. 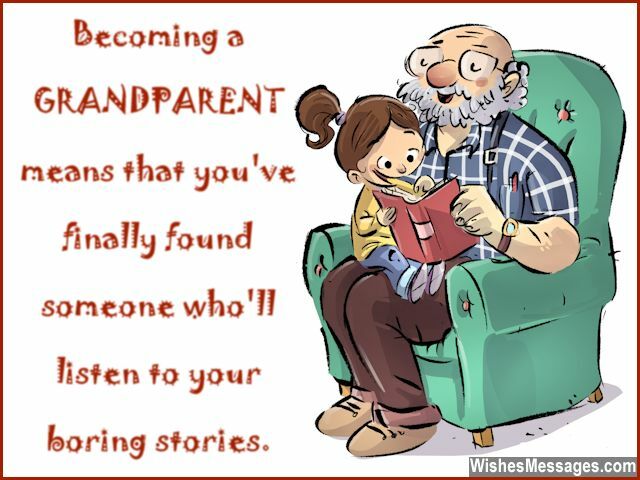 16) Becoming a grandparents means that you’ve finally found someone who’ll listen to your boring stories. 17) Your kids have given you a job that is right up your alley – being adorable and loving grandparents. Congratulations. 18) Life with grandkids will be chaotic, but it will also be full of magic. Congratulations. 19) You must have melted like butter, thawed like ice and crumbled like a cake the first time you set eyes on your beautiful granddaughter. Congratulations. 20) Welcome a new phase in life when your own kids will finally start taking your advice to bring up their own. Congratulations. 21) Your worries about how to keep busy after retiring are about go away. Congratulations for becoming grandparents. 22) Now that you’re a grandparent… you will finally understand the true meanings of legacy, lineage and ancestry. Congratulations. 23) Today, you will finally realize why your own parents were so happy when your children were born. Congratulations. 24) Becoming grandparents is like becoming parents all over again, minus all the hassle. Congratulations. 25) If the journey of raising your newborn into a successful adult has been a magical ride, watching your own grandchildren grow up in your lap is going to be a miraculous adventure. Congratulations. 26) A cute grandchild like yours deserves the love of gentle grandparents like you. Congratulations. 27) Congratulations on becoming grandparents. Your own children will finally start visiting you more often when they come to drop off your grandkids for you to babysit them. 28) Spoiling your grandchildren, is the reward for tolerating your own children for all these years. Enjoy it. 29) Your grandchildren’s hand-prints on the walls of your house will leave permanent marks on the walls of your heart too. Congratulations for becoming grandparents. 30) Grandkids are God’s way of telling you that you’ve been a responsible parent for too long… now it’s time to be carefree and spoil the kids rotten. Have fun! 31) As a grandparent, you are your grandchild’s first toy, first friend and first storyteller. Congratulations. 32) Now that your family has been extended by a cute one, may you tons and tons of fun. Congratulations. 33) I hope your GRANDkids have a GRAND time with amazing GRANDparents like you. Congratulations. 34) May your grandkids turn out to be much better than your kids. Congratulations. 35) May your grandkid achieve all the dreams that even your own kids couldn’t accomplish. 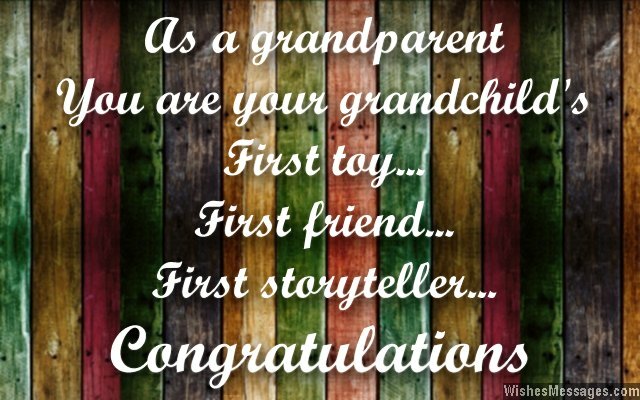 Congratulations for becoming proud grandparents. 36) Welcome to the world of changing nappies, wiping spills and singing lullabies – all over again. Have fun. 37) All your lives you must have celebrated many commemorative days, but now you will finally get to celebrate Grandparent’s Day. Congratulations. 38) Being a parent is all about showering your kids with tough love. Being a grandparent is all about showering your grandkids with guilt-free love that spoils endlessly. Congratulations. 39) Making you a grandparent was God’s way of telling you that you are worthy of being a guide and an angel for an innocent newborn. Congratulations. 40) Your grandkids deserve the love of a dotting grandparent like you, and you deserve the warmth of showering your love on life’s lineage.